When the New Zealand Naval Forces were established under the Defence Act of 1913, an Agreement was reached with the Admiralty that New Zealand ships would wear the same ensign and jack as ships of the Royal Navy. This Agreement was the authorisation for His Majesty’s New Zealand ships to wear the White Ensign, as was the case with HMS Philomel, commissioned into the New Zealand Naval Forces in July 1914. It is unclear, however, whether or not Philomel wore a New Zealand national flag in addition to these. Certainly from 1921, units of the New Zealand Division wore the New Zealand national flag as a jack. During the 1920s New Zealand ships began wearing the New Zealand national flag as a jack, although there seems to be no consistency either between ships, or even within the same ship during different commissions. Certainly, by the 1930s the New Zealand flag was customarily worn as a jack. At sea, however, a jack is not usually worn and the White Ensign did not provide a sufficient display of the national identity, particularly in baffle. Even during the First World War HMS New Zealand wore the New Zealand national flag when in action (we have no information on whether or not Philomel did, although I suspect that she did not). During the Second World War New Zealand ships wore the National Flag in addition to Baffle Ensigns. The granting of the title Royal New Zealand Navy to the New Zealand Naval Forces in 1941, was essentially an incidental matter at the time, albeit one of some significance from an historical perspective. With this view, it is understandable that there was no discussion of changing ensigns at the time. Throughout the remainder of the Second World War RNZN ships fought under the White Ensign as they did in Korea and during Confrontation in Malaya. Early documentation on discussions in respect of the development of a distinctive white ensign for the RNZN is particularly sparse. It would seem that the spark for the change was the introduction of the Australian White Ensign by the Royal Australian Navy in 1967. 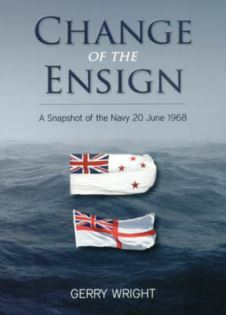 The White Ensign continued to be worn by New Zealand naval vessels until 1968. The question of a distinctive New Zealand White Ensign was addressed. Mr E.W.Jones of the Hydrographic Branch was invited to propose a suitable design and drawing of a New Zealand White Ensign. Following consultation with the Admiralty, the proposed New Zealand White Ensign was submitted to Her Majesty the Queen for approval, which was given on 20 June 1968. This is seen as an important milestone in the development of Royal New Zealand Navy.